Baby Trey isn't a baby any more! He's a big two year old now. In honor of his entrance into the "Tremendous Two's" we had a dinosaur party. I really loved this party even though I was definitely still suffering from the pregnant ickies all through its planning and execution. Let me tell you what made all the difference in the world I think... we kept it simple! I used mostly things I had to decorate. The turned bowls my dad had made me, rocks and ferns from our yard, some dinosaurs I picked up at the local consignment sale. The menu was simple too... cupcakes, ice cream, sodas, watermelon and cantaloupe. I made the kids some favors out of old baby food jars, tutorial here. I covered the table in brown kraft paper, topped it with an old Crate and Barrel table runner and then went to town throwing rocks, ferns and moss here and there. The cupcakes sat perched on my tree trunk cake pedestal. but definitely not the kids! I followed this tutorial to make it. Don't let me mix words here... this was HARD! My fruit sculpting skills are not up to par. It took me an entire morning and I almost chopped my fingers off a couple of times. Seriously. So, on a less bloody note. Funny story, you mamas will appreciate this. The boys were out playing in the front yard while I finished icing the cupcakes. Our 10 year old neighbor came running up to my front door and said "Hey, Owen wants to know if I can come to Trey's party!" Hilarious! I was like, "Um, sure!" Well let me just tell you that I literally had to chase the kid down upstairs to get him to leave at the end of the party! I think he likes us! We have a huge family and everyone is close by, so parties are always just family and one of my oldest and dearest friends, Blair's family. 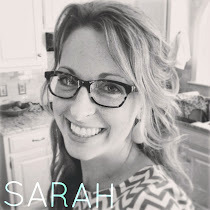 We got her to move in to the "Tucker Compound" a few years ago and her boys are the same age as mine. We do all of our parties together. We made crayons for the big kids to color. They are always a hit. You can get tons of plastic molds here. I used a new technique this time and it was so much easier... peal the wrappers off of Crayola crayons, break them in to small pieces and put them in a foil muffin wrapper, bake at 220 degrees until the crayons turn to liquid then pour them into the mold of your choice. Let harden on the countertop for an hour. but the kid did realize what to do with the cupcake! That's my boy! 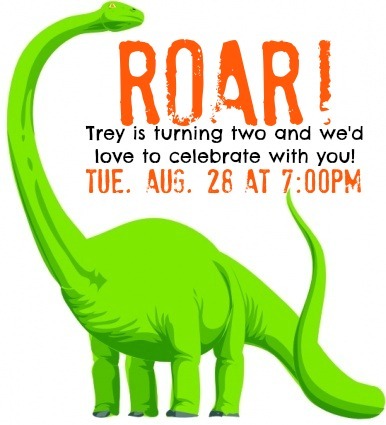 Happy Birthday, Trey! We are so proud of you!! This is SO great! All three of my children have birthdays during the third week of September, so we do one big party for all three. We have two girls and a boy, so I have to keep it gender neutral. This year is Mickey and Minnie... but I love seeing frilly parties for girls and rough and tumble parties for boys. 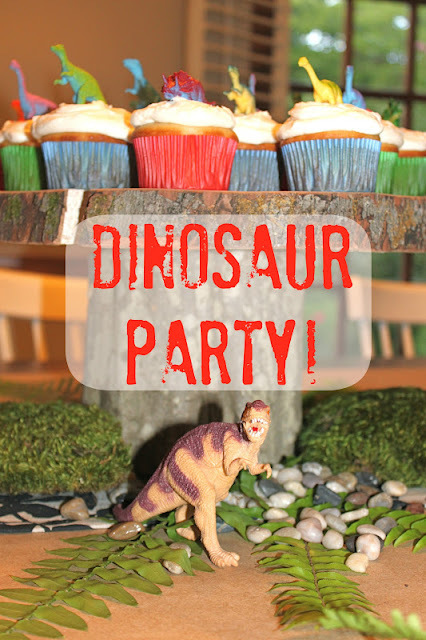 That watermelon dino is fantastic :) Such a fun party for your little guy!